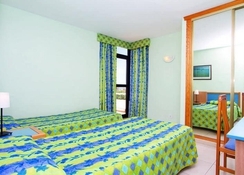 At a distance of only 400 metres from a beautiful beach and only a short distance away from some of the best eateries, bars and shops, this aparthotel offers great accommodation in modern spacious 2-floor bungalows surrounded by lush, green gardens. The hotel guarantees you an intimate and private atmosphere to make the most of your days while you are holidaying in the Canary Islands. 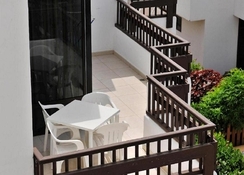 The studios and apartments are near the sea and come fitted with all the amenities. There is an on-site buffet restaurant that caters to delightful menus. The pool area has a mini bar, which serves exquisite fusion drinks. With separate pools for kids and two playgrounds, the Paraiso Del Sol Apartments are among the best options to stay in the Canary Islands. 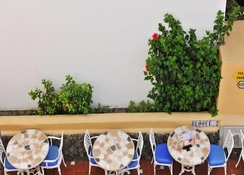 The hotel is located at a distance of 15 km from Tenerife Sur Airport. The nearest beach, Playa de Troya is around 400m from the property. Well connected from Gomera, it is easily accessible from all major cities in the Canary Islands. Paraiso Del Sol features spacious and cosy apartments categorised as Standard Studio, Triple Studio, Apartment 1and Apartment 2. The apartments are well equipped with amenities such as satellite TVS, refrigerators, coffee makers, kettles, toasters and room safes. Each of the rooms boasts of a kitchenette and a furnished private balcony or a terrace, which guarantees great views of the garden or pool. The aparthotel serves buffet breakfast, lunch and dinner at its in-house restaurant. The menu covers a wide range of international cuisines. The pool area features a Surf Bar, where the guests can savour lighter meals, snacks and fusion drinks. Paraiso Del Sol Apartments cater to adults and kids alike, when it comes to sports and entertainment facilities. There are 2 outdoor fresh water swimming pools with spacious sun terraces, ample loungers and parasols. These pools have heating options during the winter months. For younger guests there 2 outdoor paddle pools (heated during winter). Among other sports facilities, the guests can avail playing table tennis, billiards while the kids can stretch themselves at the two extensive playgrounds within the hotel premises. On Paraiso Del Sol Apts. I stayed here in May. The room was light and airy, clean and safe. The room we booked had 2 single beds which was a studio apartment, a bedside table, a dressing table and tv, a fridge, hob, sink, cooking utensils. There was a sliding mirrored wardrobe with safety deposit box, bathroom had bath and shower. Was clean and fine, basic but everything we needed was there. Pool area is clean and private, pool bar is there too. 5-10 minute walk from the beach with supermarkets next door. I would recommend here and wouldn't mind returning again as had no issues. Staff were also helpful and polite. However we would certainly consider returning as we had a good holiday. The apartment was found to be clean and fit for purpose. Kitchen facilities were handy. The breakfast was good and evening meals were hit and miss. Staff generally friendly.